Yes. It's happening. I turned 33 earlier this year and it would appear that my fancy dress party invitations are dwindling. I can't deny I'm MASSIVELY disappointed with my friends (YOU KNOW WHO YOU ARE) but it just so happens that I know two small children whose invitations to fancy dress parties are most certainly on the increase. And dressing them up is almost as fun as getting dressed up myself! 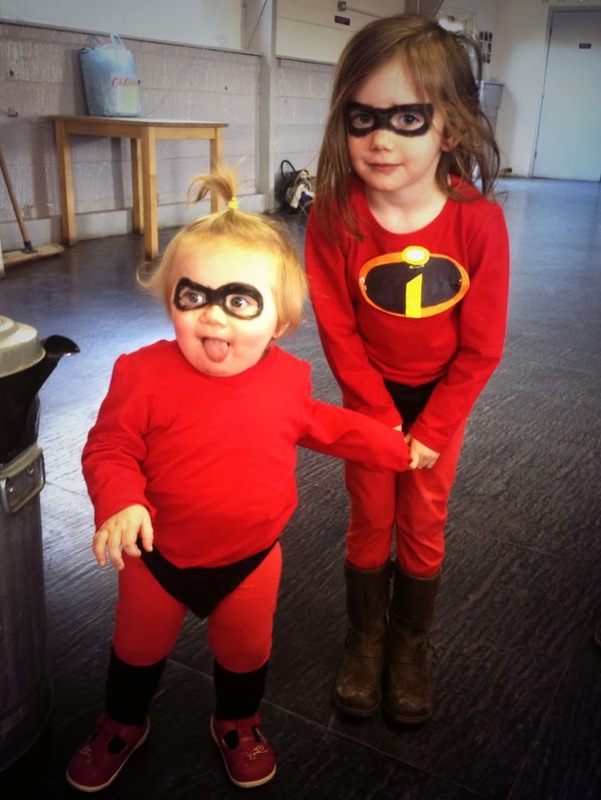 Today's party theme was SUPERHEROES, and Daisy and Evie went dressed as Violet and Jack Jack from The Incredibles. It took a fair bit of effort to persuade Daisy to dress up as a superhero rather than a princess, and there were tantrums galore when we couldn't find black girl's knickers and had to buy boy's pants ('I'M NOT WEARING BOY PANTS!!!!!') but hey.... we got there in the end. Its a super easy - and super cheap - costume to put together. You only need a pair of red leggings, a long sleeved red top, a pair of black pants, a pair of black socks and some black face paint. If you fancy having a go at making the Incredibles logo for the front of the t-shirt then you also need a piece of paper, orange, yellow and black felt tipped pens, and a few safety pins to fix it on. PS Turns out one year olds REALLY hate having their faces painted, hence Evie's wonky eye mask!